The California Department of Health has adopted a team of educational cartoon characters developed by Montebello Unified School District, the district’s nutritional services director, Victoria Cheung, said at a recent school board meeting. The state is recommending that other districts and agencies use MUSD’s “Harvest Heroes,” a series of masked superheroes modeled after produce grown in California, such as asparagus, strawberries, squash, apples and artichokes. One character is featured each month to teach facts about the produce, familiarize students with it, and to introduce them to recipes using the produce. With the help of these characters, students learn to enjoy produce that is usually not very popular, including kale. “We’re excited that the kids are excited about it,” said Cheung. The drawback of some of the less popular produce, such as artichoke and asparagus is that they can sometimes be too expensive for the district to offer on a regular basis. One of MUSD’s Harvest Heroes. The district has used the characters to introduce students to new foods for the past five years, Cheung said, and now similar characters can sometimes be seen in ads put out by the state. 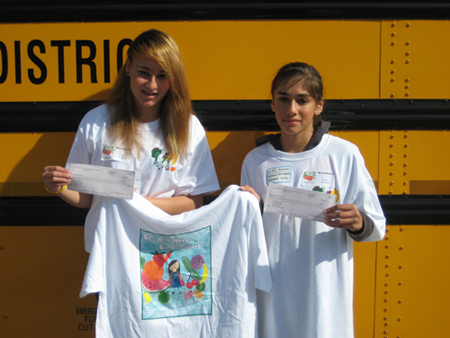 Drawing contest grand prize winner Briana Stokes of Bell Gardens High School, left, and runner-up Cynthia Gastelum of Eastmont Intermediate. Another runner up, Kimberly Zaldana of Bell Gardens High School, is not pictured. Meanwhile a long-standing nutrition education tradition at the district was continued this year. As in years past, students from MUSD won big in the state’s Nutrition Advisory Council drawing contest. Bell Gardens High School students Briana Stokes and Kimberly Zaldana won the grand prize and the runner’s up prize respectively this year. Eastmont Intermediate student Cynthia Gastelum was also a runner-up winner. The grand prize drawing was printed on a t-shirt, and all winners receive $75. Stokes’ winning drawing follows the district’s “heroes” themed approach to nutrition, and features a girl caped crusader, standing with her hands on her hips amid a colorful assortment of fruits and vegetables. When this news was given at a recent school board meeting, Board Member David Vela, an alumnus of Bell Gardens High School, said he was also a winner in the contest and had his drawing printed on a t-shirt. Cheung says the popularity of nutrition education has grown in the district, with more and more teachers in the district seeing its value and bringing it into their classrooms. At one point there were only 50 classrooms in the district teaching nutrition, and now there are 500, she says. “They are not just telling students to eat properly during testing, but every day, telling them to eat more healthfully, to eat smarter,” Cheung said. In addition to education, the district has also been able to offer healthier breakfast and lunch options, including pizza made out of whole-wheat dough, and breakfast sandwiches that use turkey ham. At the same time, students are increasingly choosing to eat school breakfasts and lunches. Cheung says their goal is to make sure students are interested in the food they provide, and they do not skip meals. Cheung says it is helping that vendors are slowly updating their offerings. “Manufacturers are realizing the whole culture is slowly changing and there is more demand from customers, Cheung said.